After nearly 40 years of marriage, Joan and Joe Castleman (Glenn Close and Jonathan Pryce) complement each other. Where Joe is casual, Joan is elegant. Where Joe is vain, Joan is self-effacing. And where Joe enjoys his very public role as Great American Novelist, Joan pours her very considerable intellect, grace, charm and diplomacy into the private role of Great Man’s Wife. Joe is about to be awarded the Nobel Prize for his acclaimed and prolific body of work. His literary star has blazed since he and Joan first met in the late 1950s. 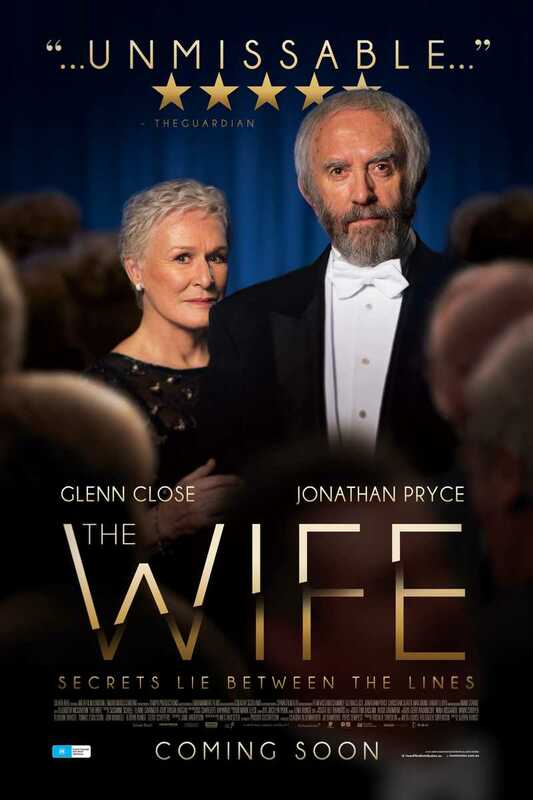 The Wife interweaves the story of the couple’s youthful passion and ambition with a portrait of a marriage many years later – a lifetime’s shared compromises, secrets, betrayals and mutual love.